FILE - This combination of photos shows Venezuelan President Nicolas Maduro (L) delivering a speech in Caracas, Feb. 2, 2019, and opposition leader Juan Guaido addressing a gathering of supporters in Caracas, Feb. 2, 2019. 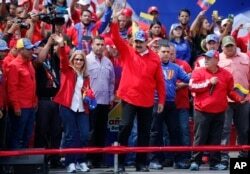 President Nicolas Maduro and first lady Cilia Flores greet supporters as they arrive at a rally in Caracas, Venezuela, Feb. 2, 2019. 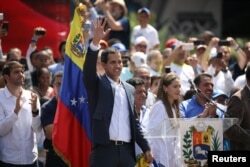 Venezuelan opposition leader and self-proclaimed interim president Juan Guaido waves to supporters during a rally against Venezuelan President Nicolas Maduro's government in Caracas, Venezuela, Feb. 2, 2019.